The King of Dramas is a must watch for any kdrama fan. Like Worlds Within before it, it takes place behind the scenes of a drama shoot. Unlike the latter show — the main selling point of which was to feature Hyun Bin playing a more or less normal guy that I didn’t constantly want to punch in the crotch — it’s an entertaining, bouncy, meta, and at-times hilarious look into the world of kdramas. Behold Anthony Kim, the King of Dramas. The show might not be an accurate depiction of what goes on behind the scenes of drama production – or maybe it could, for all I know – but I would trade realism for its zaniness any day. This is a rare kdrama recommendation for me: I don’t know how much I care about the leading couple, and if I get too invested in the things I traditionally care about in kdramas, then I’m left feeling a bit disappointed at the end. In fact, I did feel let down after my first viewing, but the more I’ve thought about it, the more I like The King of Dramas and its ending. Anthony Kim is the titular king of dramas. He’s a flashy executive in a leading kdrama production company, responsible for a string of hits that consistently score high ratings. He’s one of those guys who are all ego, with a carefully crafted background and image to match. He’ll also do anything to score ratings in a drama, never mind the integrity of his actors or writers, or the safety of the crew’s stunt team. But it’s just as cutthroat of a world behind the scenes of kdramas as it is on the screen for so many of them, and it isn’t long before Anthony is knocked down from the top of Empire Productions. We find him years later, on the verge of bankruptcy, living in the back room of the office he bought for his new production company. He has one chance to make it before utter ruination, and that chance relies on rookie writer Lee Go Eun. Lee Go Eun spent years slowly working her way up the ladder, serving as an assistant to a popular, successful kdrama writer. Mere days before his own fall, Anthony Kim betrayed her as he was soon to be betrayed, and since then she’s quit the business and been working in her mother’s grilled mackerel restaurant. When Anthony comes crawling back she has to decide whether to trust that he’s truly offering her the chance of a lifetime, or if he’s just going to burn her again. Lee Go Eun is a great, relatable, interesting character as well, but she’s not over the top like Anthony or Hyun Min. Anthony’s managed to find himself a rich Japanese investor, someone who will front the money needed for a new series. 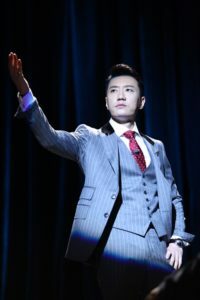 He has one request: the drama must be set during the time of Japan’s occupation of Korea; the investor’s mother was Korean, and he’s fascinated by the time period. No one’s knocking down Anthony’s door with scripts, but he remembers that Go Eun submitted a spec piece on just that topic. So far everything seems serious, and it is, for the first couple episodes of the drama. Go Eun’s grousing is entertaining and relatable, but the hilarious bits of the show don’t kick in until the arrival of Kang Hyun Min. Played with over-the-top unabashedness by kpop star Choi Si Won – kpop stars appear in dramas a dime a dozen these days, but Choi Si Won’s work in The King of Dramas is hands down my favorite – Kang Hyun Min is the self-obsessed, vain, cheesy hit star that Anthony and Go Eun must court if they want a network to pick up their drama.